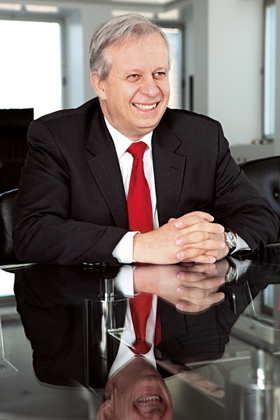 Valeo CEO Aschenbroich has reduced the supplier's business units to 4 from 11. Valeo SA has made changes to its top management as part of a reorganization of the company around four business groups. The French supplier says the new simplified structure and a strengthening of the role of its country organizations aims to accelerate the growth of the company's product families and improve profitability and efficiency. Christophe Perillat heads the new comfort and detection systems business group, which covers interior controls, security systems and driving assistance products. Perillat remains in charge of interior control products. Perillat, 43, and a French native, has been with Valeo since 2000. Michael Schwenzer is in charge of powertrain systems, the new business unit covering engine and electrical systems, transmissions and powertrain efficiency products. Schwenzer, 58, remains head of transmission products. Schwenzer, a German, joined Valeo in 1993. Alain Marmugi heads thermal systems, a new unit that regroups climate control, compressors and engine cooling and comfort enhancement products. Marmugi, 57, keeps his direct responsibility for climate control products. Marmugi, a French native, has been with the Valeo since 2001. Antoine Doutriaux takes charge of visibility systems, a grouping of lighting and wiper systems. Doutriaux remains head of the wiper systems. Doutriaux, a 44-year-old Frenchman, joined Valeo in 2003. Valeo CEO Jacques Aschenbroich said the suppliers previous organization in eleven branches was no longer suited to the globalization of the companys customers and markets. I am convinced that this new organization will enable the group to better respond to the challenges of the automotive industry by identifying strong synergies and by managing more efficiently and in closer proximity to our customers in markets with high growth potential, he said. Aschenbroich replaced long-standing Valeo CEO Thierry Morin on March 20. The business group heads report to Luc Bleriot, Valeos chief operating officer. Valeo ranks No. 15 on the Automotive News Europe list of the top 100 global suppliers, with sales to automakers of $10.3 billion in 2008.